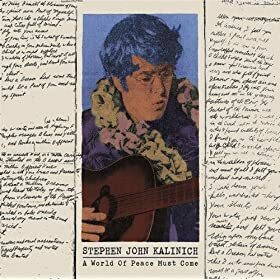 One can’t review the recent release of Stephen Kalinich’s A World Of Peace Must Come on the same terms as a conventional music release – primarily because it is essentially a poetry album, and also patently homemade. And even although I can’t claim to be overqualified to review music, I feel even less qualified to discuss poetry. The story of Kalinich is compelling -the poet who befriended and colloborated with all the Wilson brothers; the poet who spread a message of peace and harmony even in the madness and excesses of the late 60s. As a Beach Boys-related artifact, this album deserves to see light of day, but it is much more than this – it’s a stirring evocation of the spoken word and a time capsule that was maybe meant to be held back and speak to us all in 2008. This entry was posted on Tuesday, October 7th, 2008 at 10:00 pm	and is filed under Beach Boys, Brian Wilson, General Music, Record Reviews. You can follow any responses to this entry through the RSS 2.0 feed. You can skip to the end and leave a response. Pinging is currently not allowed. Also, I added your home page to my linkblog. I’ll keep reading. Thanks.